Sometimes the best documentaries are unlooked for stories that surprise both the audience and the filmmaker, and this is part of understanding the wonderful experience of watching [email protected] Director Stephen Walker set out to create a BBC tv documentary, perhaps covering some of the ground of previous documentaries about the [email protected] chorus, and yet his film has grown legs and achieved international release as a feature film. Although its origins often show, the film transcends and becomes one of the more moving in recent memory. With a new stage show beginning in seven weeks time, Walker follows [email protected] Chorus Director Bob Cilman as he attempts to teach his charges several new songs. 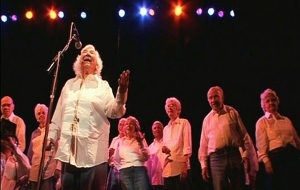 This is no ordinary singing group, however, with the members drawn from nursing homes and averaging over 80 years in age; they also perform songs by The Clash, Talking Heads, Sonic Youth and Coldplay. Several members appear to have real talent while for others participating gives their lives the purpose and direction they fear they would otherwise lack. Their journey to opening night will be eventful, testing their resolve before finally culminating in triumph. Walker allows the natural comedy of witnessing the performances of the group shine through, in a way that maintains the dignity of his subjects at all times. [email protected] could very easily have veered into mockery, and yet the audience is encouraged to laugh along with the elderly singers, just as they frequently laugh at themselves. With its subsequent detour into the tragic, however, the film gains new heart and its characters new depth; it is in its latter half that [email protected] truly shines. Walker seems to really admire his subjects, and when presented with an unexpected story to tell he realises he must tell it in a fashion deserving of its participants. Unfortunately, some of the concert sequences are poorly shot, perhaps the most major technical flaw in the production, but possibly one that reflects its origins as a made-for-tv doco. There are frequently rather clunky scene transitions, and Walker’s narration is often clumsy and intrusive. [email protected] is also too long for its story and could have done with some trimming, with its 108 minutes probably five too many. There are several very clever decisions, however, including that to leave entire sequences from the concert intact – without this footage the film would lose its emotional pay-off. This review is my 68th for the year, and I have seen many more films that I am yet to critique. It isn’t common for me to write too much of my own experience of a film, preferring mainly to comment on direction, plot, performance and the other mechanical components of the films I see. What I will say is that [email protected] left me weeping, and while it has flaws – some major – that are impossible to ignore, it goes straight to the top of my ‘must experience in 2008’ list. The subjects are so incredibly inspiring and the respectful handling of their story so deft, it is impossible not to be moved. And Fred Knittle is my new hero. This entry was posted in Film Reviews and tagged Documentary by Mark Lavercombe. Bookmark the permalink.